Well, it seems as though I’ve taken another hiatus without really wanting to. With all the things going on in our lives, writing this blog always seems to take a back burner on my list of things to do. The summer just flew by, between trips to our cottage and a family trip to Spain. We were very lucky to have had fantastic weather and we were able to enjoy some great times and experiences together. Now, almost at the end of September, we are in full swing with school, homework and, after school activities. I hope that you all had a great summer and that you are all adjusting to being in fall mode. What I love most about this time of the year is the comfort food. 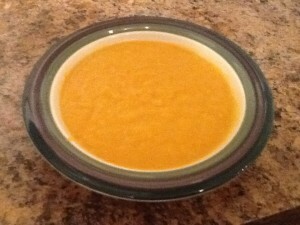 One of my favourite soups is Butternut Squash Soup. My neighbour Angela had been raving about her soup so one day when she made a batch, she brought me a sample to the park. It was love at first taste. Carefully puree the soup in batches in a blender, or use a stick blender to puree the soup right in the pot. Once the soup has been pureed, return it to the pot and stir in cream. Season with nutmeg, salt, and pepper; simmer gently for 5 minutes. Ladle into bowls and garnish with chopped chives. Pretty nice post. I just stumbled upon your blog and wanted to say that I’ve really loved surfing around your blog posts.